In this Uruguayan solo play famed actor Sarah Bernhardt (1844-1923) relives her colourful past as she writes her memoirs. The accumulation of odd biographical details, like her sleeping in a coffin, does nothing to explain why Bernhardt was the most acclaimed actor of her day. She tells us that she is the only actor to have played both Ophelia and Hamlet, but what quality did she possess that made this possible? 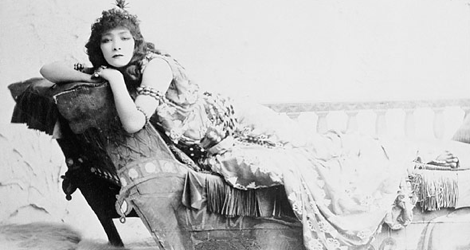 The play suggests that Bernhardt’s career ended with the amputation of her right leg in 1915, but, in fact, Bernhardt amazingly continued acting sometimes using a prothesis until 1922. As Bernhardt, Edith Acker exudes liveliness but little charisma. Her best moment is when she delivers Bernhardt’s compassionate account of her sister’s death. She is hampered by Mario Tenorio's uninventive direction that leaves her too often ensconced behind a desk simply reading out to us what Bernhardt writes. In the play’s original production in Montevideo in 1997, the ageing Bernhardt was played by a young man. One wonders whether this would have given the play a more metatheatrical edge and would have made the point much clearer that “The Divine Sarah”, as she was called, was a role that Bernhardt never stopped playing once she had invented it. Note: This review is based on my review for NOW magazine from 2016-07-01. Photo: Sarah Bernhardt as Cleopatra. ©1891.